Think of beef and you think of Argentina- the spiritual home of all things meaty! Chimichurri is a classic accompaniment to a good steak. Its fresh and punchy flavours bring out the best of a rib eye so read on and get cooking. I bought smoked sea salt from the lovely people at www.thespiceshop.co.uk. 1. You can start in advance by prepping the chimichurri. Simply roughly chop the ingredients and add to the wet ingredients and give a quick blitz in a food processor. You are after a saucy consistency. Alternatively finely chop the ingredients and give it all a good bashing in a mortar and pestle! Cover and set aside until you need it. 2. For the vegetables, cut the peppers and courgettes into chunks and the red onions into wedges and toss with a good drizzle of oil. I nestle a few whole garlic cloves in amongst the vegetables before seasoning well, popping the oregano in and off you go! Roast in a preheated oven for around 20 minutes at 180c/ 160fan until tender. 3. 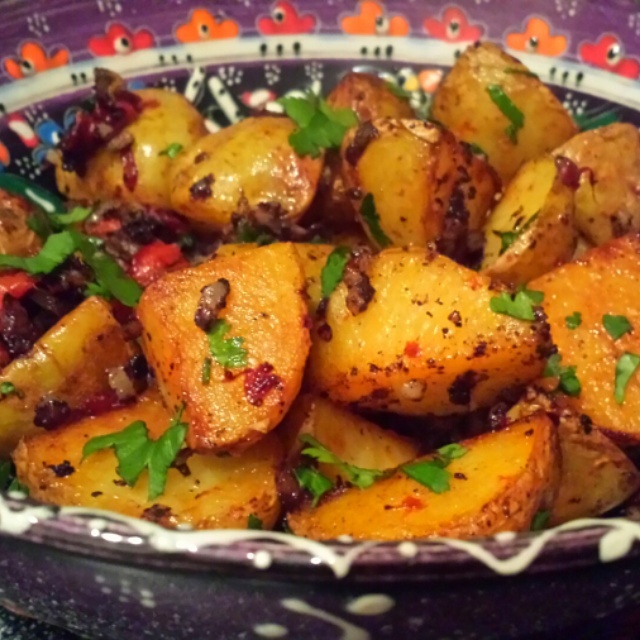 I like to serve this with simply roasted new potatoes. Start by parboiling the potatoes for a few minutes before draining well. Pop them in a baking tray with another good glug of oil and sprinkle over some smoked salt. I love the edge that this salt gives and it goes with the steak perfectly. Roast in the oven next to the vegetables for around 30 minutes until golden. 4. When the potatoes have around ten minutes left, prepare the steak. I like a beautiful rib eye but anything robust works well here- maybe save the fillet for another day though… Season the meat well and rub a little oil over it before cooking in a hot pan/ griddle. For an average rib eye I like to give it two minutes on each side for a rare finish but cook according to your preference so long as it’s not well done! There is more flavour from boot leather! 5. Rest the rib eye whilst you take the roasted vegetables and potatoes from the oven. Either divide the veggies between four plates or serve on a large platter with slices of the steak over the top and finished with a drizzle of the chimichurri so everyone can help themselves. 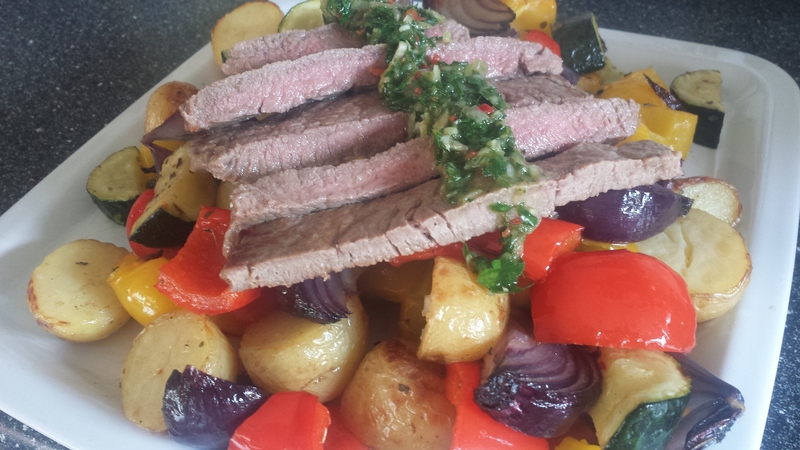 Rib eye, roasted vegetables and smoked salt potatoes with a classic chimichurri- you’ll love it! Sweet, delicate sea bream paired with fresh baby leeks is a perfect match for these seasonal delights. Sea bream can often be overlooked so give it a chance and give this speedy recipe a go. 1. Start off by preheating the oven to 180c/ 160 fan, boiling a medium pan of water and heating a griddle to a medium/ high heat. Take a large non- stick frying pan which can fit both bream fillets easily- don’t crowd them! Heat half of the butter over a medium/ high heat and when melted, add the fillets skin side down and cook for 2 minutes. I season the skin before adding to the pan and aim to get the skin beautifully crisp and golden. The butter will foam which makes it nice and easy to then baste the fillets. 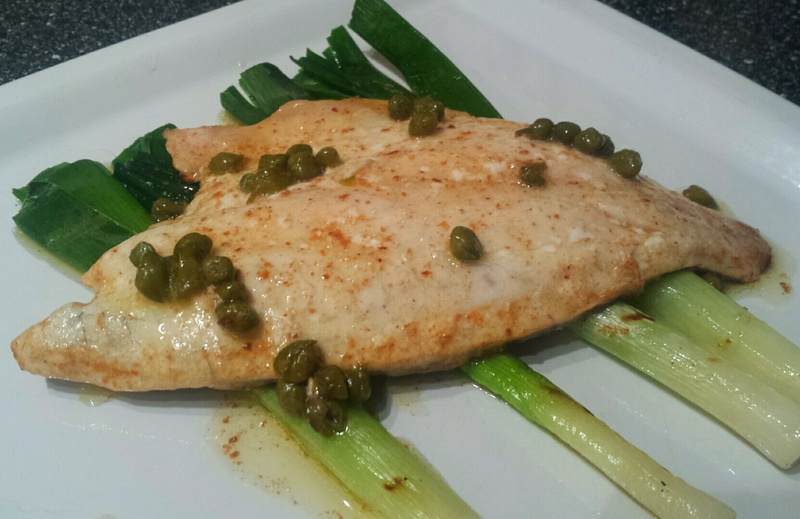 When the fillets are ready, pop in the remaining butter, capers and a good squeeze of lemon juice before basting once more and putting in the oven for an additional 2 minutes. When the fish is ready it will look translucent so don’t overdo it. There’s nothing worse! 2. For the baby leeks all you need to do is make sure they are well washed to remove any grit that may be lurking and then simmering in a pan of boiling water for 2-3 minutes until they become tender. Remove the leeks carefully and finish off in the griddle pan until slightly charred. 3. When everything is ready to go, arrange the leeks on the plate and lay the bream on top. Add the parsley to the butter sauce before pouring over the fish and leeks and you are good to go! I served this with steamed new potatoes which are also bang in season. Sea bream with baby leeks- a celebration of spring ingredients! A wonderous thing happened a few weeks ago when walking around Borough Market. We stumbled across a Spanish produce stall and morcilla jumped into my hands and propelled me towards the counter to seal the deal and I’m glad it did! Morcilla is a Spanish blood sausage which is perfect crumbled through dishes so this is when this recipe was born. 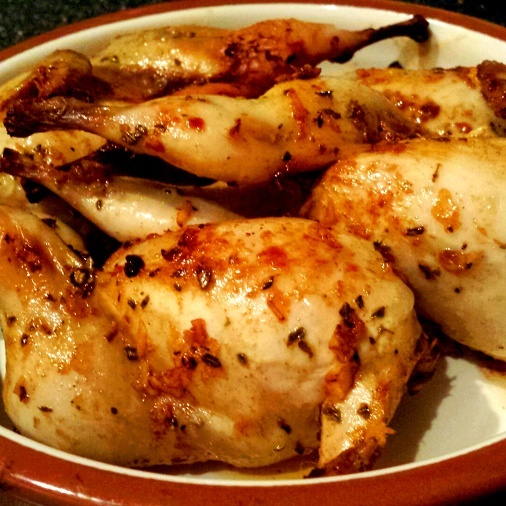 I allowed two quail per person for a main meal but this recipe is easy to double as needed. I also served this with a dressed green bean side dish which is well worth a try so read on for the recipes for the quail, potatoes and beans! 1. Get started by making the marinade for the quail by combining the sherry wine vinegar, oil, paprika, oregano, honey and seasoning. Cover and set aside for at least an hour but longer if you have a bit more time. 2. Preheat the oven to 180c/ 160 fan when you are ready to get going, pop the quails in a roast dish and cook for around half an hour until cooked through and the juices run clear. During cooking I basted the quail in the excess marinade to keep them moist. I also covered them with foil for the first half of the cooking time before removing for the last part. 3. While the quail is roasting you can start the potatoes. Par boil the potatoes for a few minutes before removing and halving. If you halve them before cooking they can get a little soggy so this way round is better. Drain well and set aside as you heat a glug of oil in a frying pan. Pop the potatoes in the pan over a medium heat for 10 minutes until they are starting to become a little more tender and turning a light golden colour. Add in the pepper slices and crumble in the morcilla and cook for another few minutes. Sprinkle over the parsley when ready. 4. At this stage you can think about boiling a separate small pan for the green beans- multi-tasking at its best! The beans need to be boiled for 5 minutes and then removed with a slotted spoon before refreshing in a bowl of cold water. Reserve 100ml of the cooking water. Using the same pan, heat a small amount of oil and cook off the garlic and shallot for a minute or two before adding the reserved water and beans back into the pan. Pop the lid on the pan and cook for an additional few minutes until the beans are tender and the water has reduced. 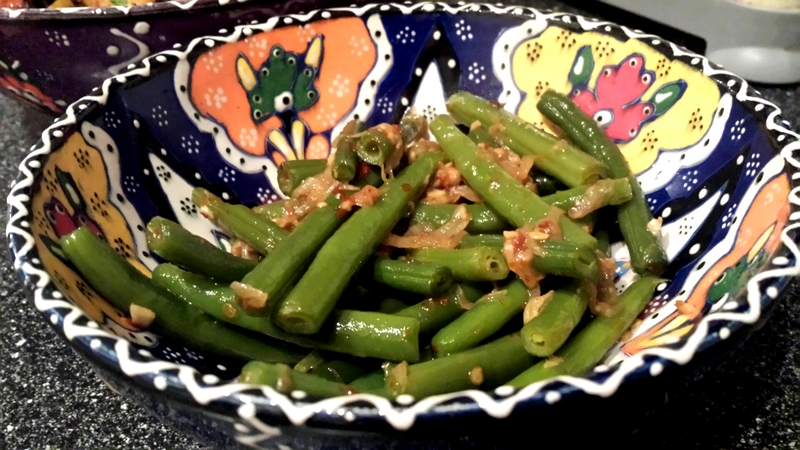 The water, garlic and shallot creates its own little kind of dressing. Serve the quail, morcilla potatoes and green beans in warmed dishes so everyone can help themselves. Spanish style quail with morcilla potatoes and dressed green beans- a perfect way to try morcilla!